This was a labour of love. One of my best friends from the UK was getting married, and I wanted to make them something as a wedding gift. I had a little something in mind, but it was a project that I knew was going to take a long time, so I was initially kinda apprehensive about starting it, it only took pretty much every bit of my spare time for about a month and a half……. but in the end it came together with at least a few days before we flew out to England! Wooo! Go me! Yeah, that didn’t happen. 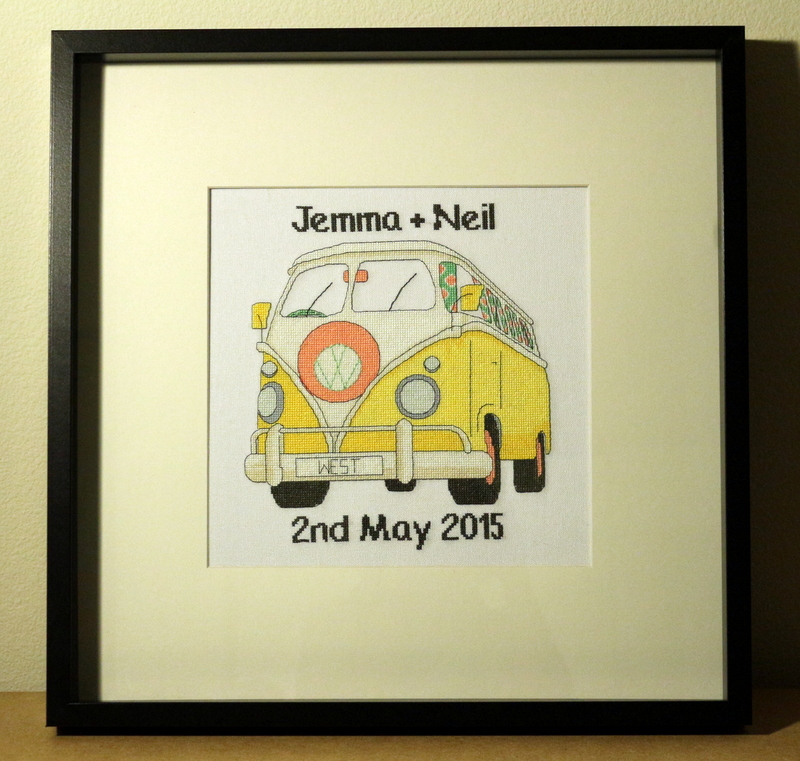 But when it came to a wedding present, I thought I would adapt the original pattern into a wedding day cross stitch! The original colours were either blue or orange, but I adapted the van itself to be yellow (the Bride’s favourite colour), and then used the colours from the wedding (mint green and coral) as the accent colours. 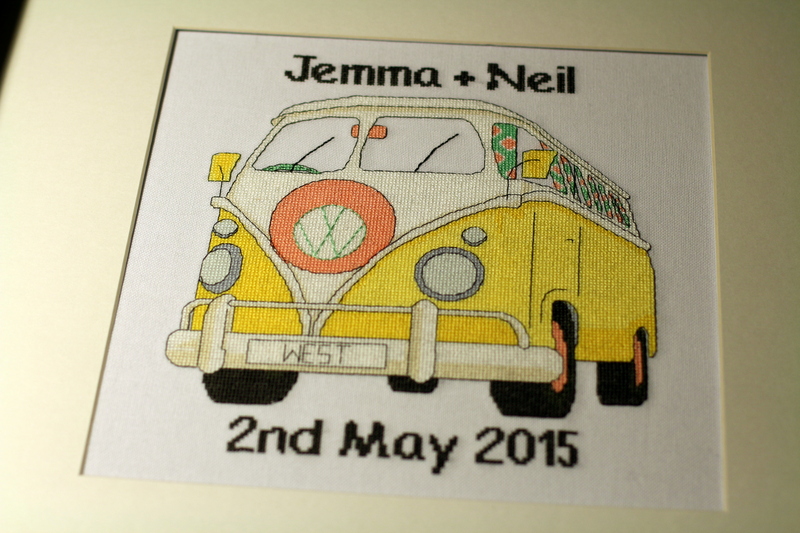 Once the main stitching was complete, I added the surname as the license plate, and then put their names and wedding date to finish it off. I did wonder if it wasn’t quite wedding-y enough, whether perhaps it needed something a little extra like cans off the back etc, but in the end I thought too much might wreck it, and it looked nice and simple and modern as it was. I was in two minds when it came to finishing it off – did I get it framed properly or do I just do it simply? As an expensive frame may not go with their decor and they may want to change it anyway. In the end I mounted the fabric using this sticky card that I have used before, and framed it using an inexpensive IKEA Ribba frame, which just happened to be the perfect size! I think it came out pretty cute, and I like the nice clean modern look that I ended up with by keeping it simple. I was wonder if I could ask for a little bit of help. My name is Erin and I am art student from Australia. I love cross-stitch and I thought that I would do a large one for a project coming up. I am very interested in the beautiful stag beetle cross-stitch you did back in 2013. I have searched and searched for the pattern but it seems that it was only available in one issue of a magazine that I can totally not get my hands on. This is where I was wondering if you could help me out. Do you still have the magazine? could you possibly send me an image of it? I totally understand if you are unable too I just thought I should ask. Please contact me asap if you can. Thank you for your help. Sure, I shall find and scan it later. They don’t seem to sell that particular one, but there are some other very similar on the designer’s website here. 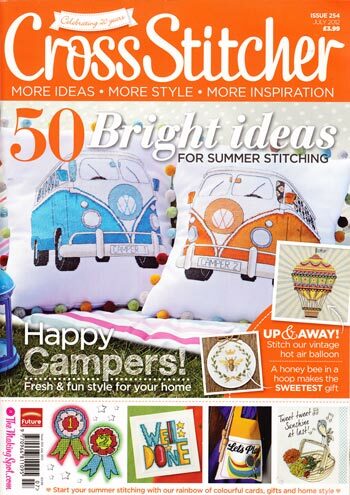 Hi I’ve gone onto the website but cannot seem to find any patterns associated with camper vans – are you able to send me a copy of the pattern as well? Thought I’d kept it but can’t seem to find it in my collection!